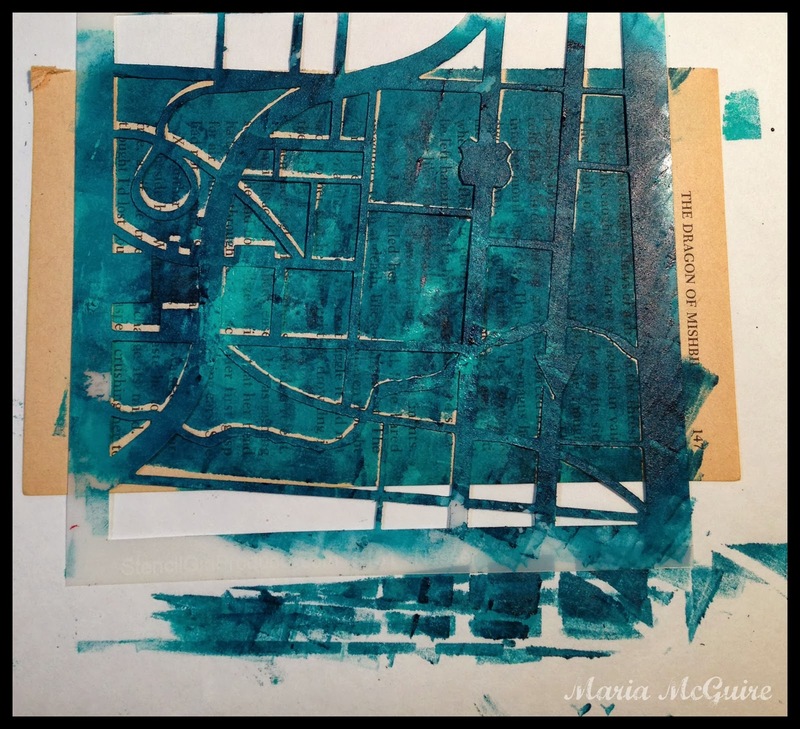 Welcome to the StencilGirl Blog Hop featuring StencilGirl Artist Mary C. Nasser. 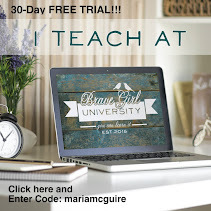 If you have arrived from my friend Carolyn Dube's blog you are on the right track :) If not, you can start the list below from the beginning to make sure to not miss out on any of the fun! In addition to being a fellow StencilGirl Artist, Mary is one of my teammates on StencilGirl Talk and I couldn't be happier to be on both teams of StencilGirl with her! If you know anything about Mary's art, you will know that it is all about the MAPS to her! It was no surprise that her stencil debut were intricate map designs! My project today started with a piece of scrapbook paper...scrapbook paper that I was about to put in my "giveaway pile". But! then I remembered Mary's stencils and it came together within seconds! I have to say this probably one of the quickest projects I've done in a LONG time for me to share with you BUT I LOVE IT!!!!!! Here is my scrapbook paper. A sheet of postcards. If you don't happen to have a piece like this--don't worry. You can either run a piece of paper through your printer or use one of the many postcard stamps on the market. I cut the postcards apart. Instant 6 postcards. Now time to embellish! 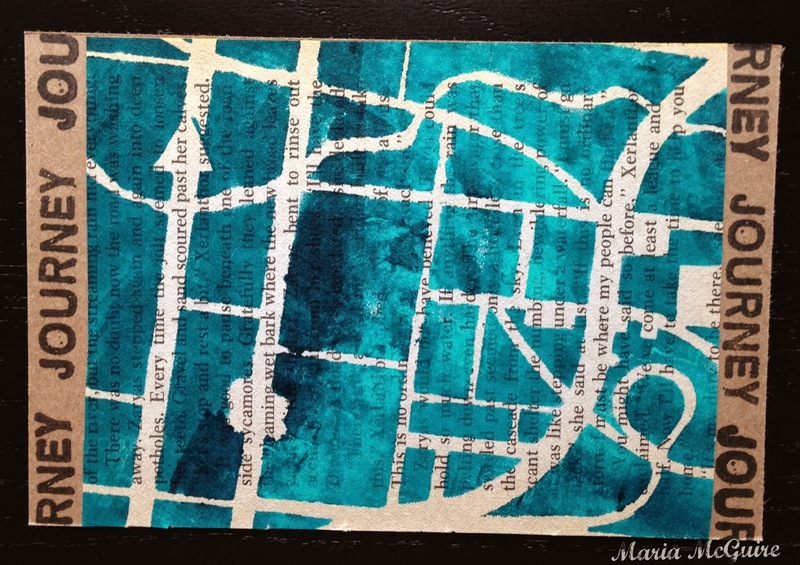 I took 6 pieces of book paper from a pocket novel and stenciled using Mary's Map 6 S161 stencil. I glued the stenciled pieces of book paper onto the front of the postcards. I then used an stamp from my stash that said Journey to embellish the sides of the card. I then turned the card over and on the printed side of the card I used Mary's Latitude and Longitude Stencil S160 to embellish the card. There you have it! Easy, quick and ready to send out! This project and stencils are going into my favorites list! 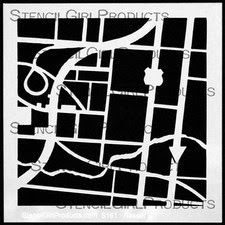 Make sure you leave a comment before you go to be eligible to win the Stencils on StencilGirl Talk. All comments on all blogs are eligible! Lovely to be on this hop with all of you!! Absolutely love those postcards! I would LOVE to win these stencils and play with them in my new journal !!! Thanks. simple, yet extremely effective! love it! Well, Maria.. what a great little project. Love this idea. This has been a great hop. Fantastically beautiful, simple, and elegant. Thanks for sharing your process using the stencils. What a great, useable, idea! just when I think I've got a mind full of inspirations already I hop on in and you blow my mind wide open to even MORE possibilities! thank you SO much for having us by on this crazy hop through, Maria! I'm going to linger and take a look around for more gorgeous creations and take advantage of more of your hospitality! Great idea! Thanks for sharing! And, thanks for the chance to win the stencil set. Great idea and beautiful work! It would feel like Christmas to get to pull this out of the mailbox! This blog hop has been great fun to be a part of. This is fabulous Maria - thank you for showing us how you did it! Good idea! 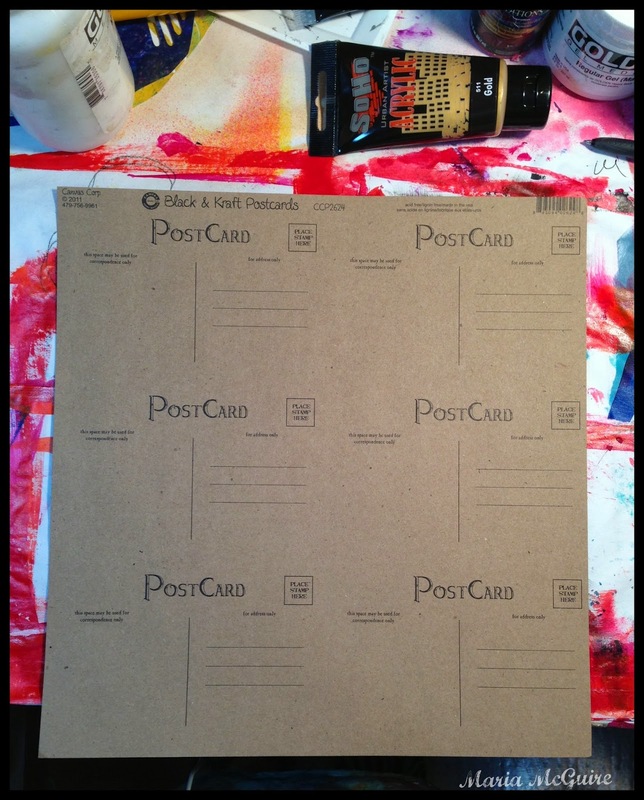 I think I might have a sheet of that postcard paper ... need to try this out myself! Thanks for sharing your steps. And thanks for the chance to win! Beautiful. I love the color you achieved with the map stencil. The postcards are really cute too! Thanks for posting this opportunity. Love that road map stencil! And I know I have postcard stamps...Great work! 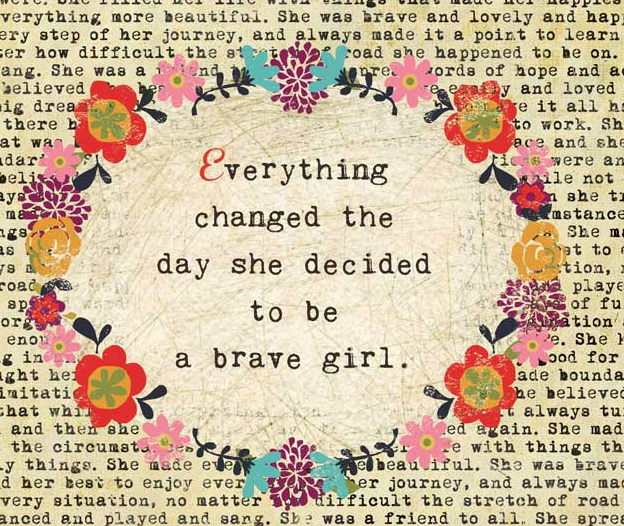 wow, last but certainly not least in my second round of bloghop. first i wanted to see all the possibilities the stencils offer and ys i am convinced they are gorgeous. also for card making as you show here...the possibilities are endless! 'easy peasy is right! What a great idea tho. Thanks for the tutorial and the stencils are now on my list. Wonderful use of stencils for mail art. Thanks for sharing. You know I LOVE the colors here! Great job, Maria! How creative! Fast, easy and so totally cool. Great job. Love your project and the use of the stencils! Great set of stencils and so many ways to use them! Perfect, easy and beautiful. Nice to see something beautiful that is doable for us artistically challenged folks who still love to play. Thanks for sharing and being In the giveaway! Great idea for mail art. A few easy steps to a very cool outcome. What a fun project! I'm going to have to look at my not so favorite scrapbook paper with a new eye. Thanks for sharing!! I heart these postcards! So wonderful...the colors, the process...you are a genius! 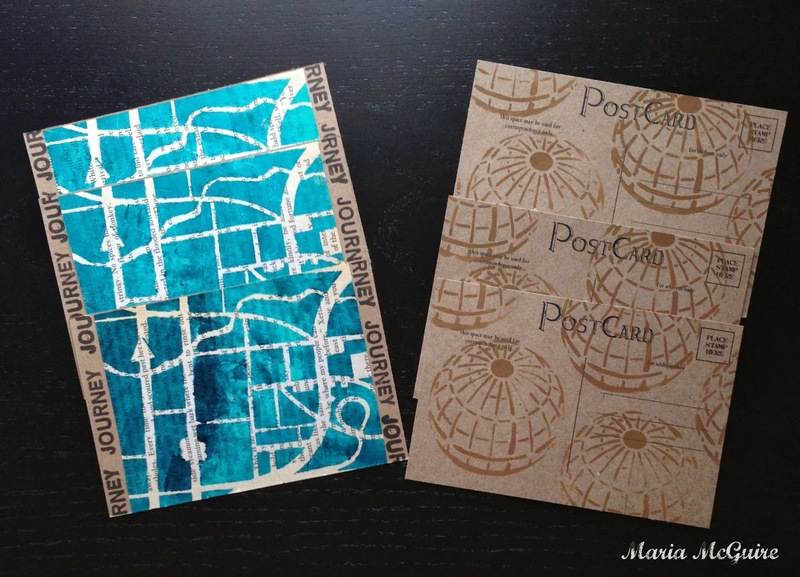 Amazing post cards.....love your ideas....now off to find my journey stamps! All I need are the stencils! Incredible talent in this blog hop! Great stencils, great works of art! would love to win a set of Mary's stencils so I can play too. thanks so much. Great postcards. Would love to win stencils to try it out. Thanks for sharing. I enjoyed this blog hop very much. I got to meet some new artists and see their fabulous work; yours included!! Thanks for the inspiration! Love the postcards! Definitely into my faves! Quick, easy, stunning. 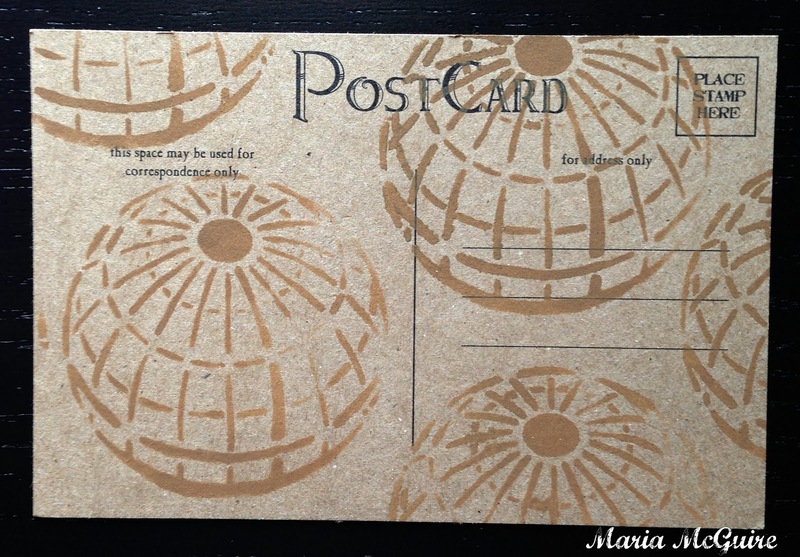 Fabulous idea - I always appreciate a quick way to make some mail art - plus this is so cool! These are some pretty versatile stencils! Wow! You make it look so easy. That stencil is perfect for mail art. Great idea! They are very cooool! Very simple (my style) but so cooool. Thanks for the chance to win these stencils. What a great idea! So creative! Thanks for the chance to win! I would love them! Wow, this looks easy but awesome too! I love the earth stamp! It is just gorgeous! wow, so simple and so nice!!! What a cute project! Looks very fun,too! Sometimes the ones that go together fast can be the best. Great job. These are beautiful! If a saw a pack of these postcards in the store I would so buy them to send out to my friends. Great use of the stencil. Thanks for the inspiration -- off to make my own postcards. Those are absolutely gorgeous! I love them! What a great idea to have them on hand for when you need them. Great use of the stencils. Fabulous! Love the transformation of your SB paper with Mary's awesome stencil. It's totally awesome to see what everyone is doing with these stencils. :) I love it! Lovely postcards Maria! love that color! I am having such an amazing time using stencils right now! They have so many uses! I love the maps because I travel frequently. Good luck to everyone!